Funk Blues Jam Track in D for funk and blues guitar practice! This funky blues backing track is in the key of D and in the style of funky blues guitar players like Freddie King and Albert King. It’s perfect for practicing those funk blues licks and solos over. So plug in and enjoy hours of fun jamming over the funk blues jam track you’ll find in this video. (1) Just because this backing track uses a blues funk feel doesn’t mean you shouldn’t keep it bluesy! The backing track is in the key of D, so use the classic blues guitar scales like D minor pentatonic and D blues scale licks and ideas. 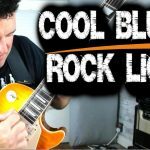 For some cool licks which go with this funk blues backing track try this lesson HERE. (2) Lock in tight with the funk blues rhythm. Funk is a rhythmic style…so whatever you do don’t let your rhythm drag. So as you play over this funk blues jam track, keep your rhythms crisp, punchy and above all, funky! (3) Leave space between phrases. This will help your licks and ideas stand out and give you a more structured sounding solo that will make sense to a listener. 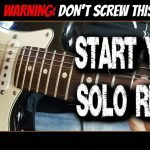 Hope this helps you with your blues funk soloing…have fun!